I hope your summer is off to a great start. I can’t believe it’s already mid-June. To all you dads out there, Happy Father’s Day! 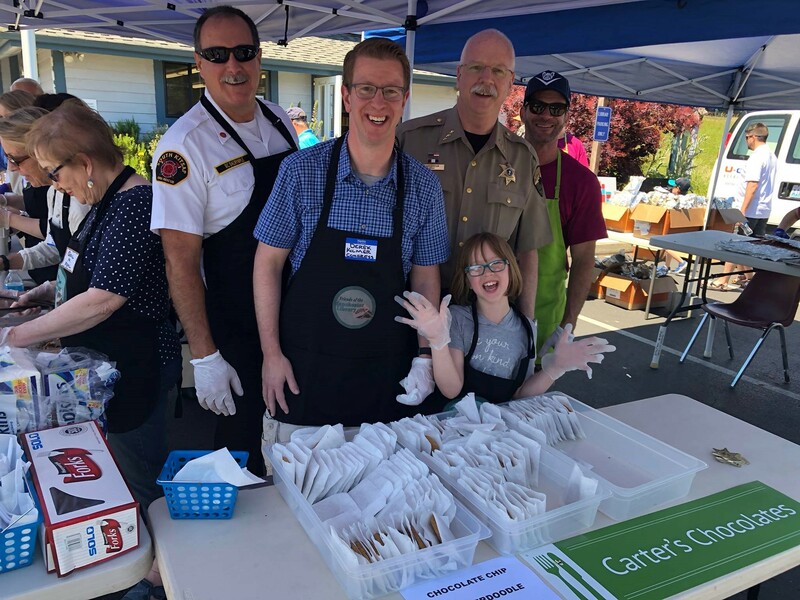 This weekend, I got to see my Dad and I also had the chance to participate in what has become a Kilmer Family Father’s Day Tradition - passing out Salmon at the Manchester Salmon Bake. It’s always a fun event in support of the local library. A lot has happened over the last few weeks. The House passed nearly 30 pieces of legislation related to the opioid crisis, and the Appropriations Committee, which decides what the government funds, passed two major bills that mean big news for folks in our neck of the woods. Read on for some details! 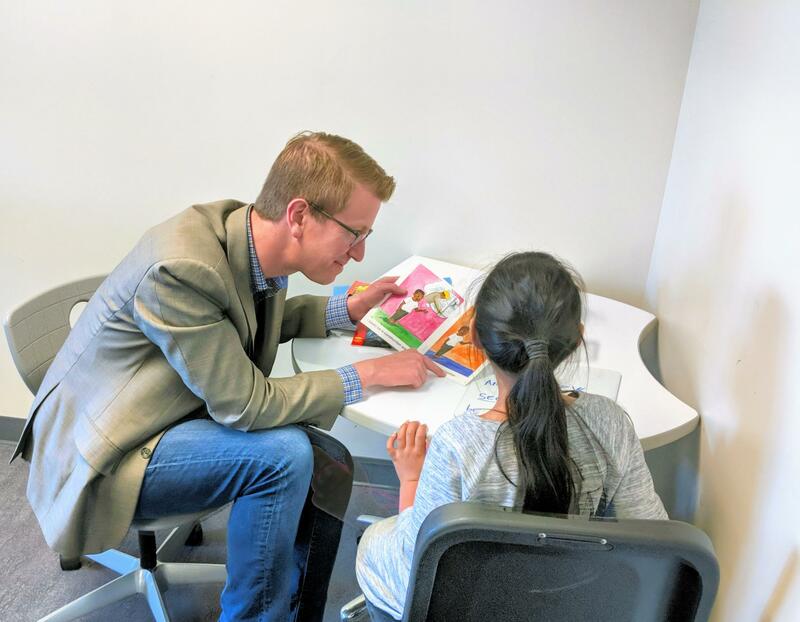 Before diving into the update, I want to let you know I’ve heard from hundreds of you about President Trump’s decision to separate kids from their parents who are seeking asylum in the United States. You may have seen the news about the administration’s decision to jail more than 100 mothers at the federal prison near SeaTac as part of this plan. In my view, President Trump needs to reunite these parents with their children immediately. If he refuses, Congress should act quickly to end this unlawful program. We can, and we must, do better than this. It’s important to note that under international and US law, those who arrive at the border and turn themselves over to authorities with a legitimate claim of asylum due to fear of violence or persecution must be given an opportunity to have that claim heard. I will keep fighting to protect our nation’s values. Here in Washington State, we’re about as far from Washington, DC as you can get, but believe it or not, the federal government is the largest employer in our neck of the woods. So, the funding decisions that happen in Washington, DC are a big deal. I’m the Vice Ranking Member of the House Appropriations Committee, and I’m fighting hard to make sure the government funds the things that matter most for us. And I have some good news for folks in our region! Late last week, the Appropriations Committee passed the Defense Appropriations bill. That bill included some important provisions, including a 2.6 percent pay raise for our service members. That’s the largest raise this decade, and I am hopeful that this raise will make it all the way through the Congress and become law. Given all we ask of our service members, it’s important for them to receive a well-deserved raise. And it’s not just the folks in uniform who will have more money in their pocket. For the last several years, I’ve led a fight against an unfair change to the Department of Defense’s per diem policy. A few years ago, the DOD decided to cut per diem rates for civilian employees and members of the military who travel longer than 30 days for work. The cuts meant workers on extended travel would be paid between 25 percent and 45 percent less than under the old policy, depending on how long they’re working away from home. I believe the government needs to get our nation’s debt under control, but I don’t think nickel and diming public servants like the folks at the shipyard who spend months away from their families is the way to do it. In 2014, when the changes were announced, I introduced a bipartisan bill to try to keep these changes from happening. Sadly, while we’ve been able to get the House to embrace my proposal to reject these per diem cuts, we’ve hit some roadblocks in the Senate. This year, though, I’m hopeful since we not only succeeded in the defense spending bill, the Senate also appears to be on board this year. That’s good news for uniform personnel, civilian employees, and even for local hotels in Kitsap County who have felt the impacts of these changes. Over the weekend, the Kitsap Sun wrote more about the defense bill and how it affects our region. There was another win for our region in the Defense bill - the bill includes funding that the Navy can use to develop technology to make the EA-18G Growlers, the fighter jets that train in the skies above the Olympic Peninsula, quieter. Over the last few years, community members who live under the training area have brought concerns about the noise to me, and we’ve worked with the Navy to come up with some potential solutions. I’m hopeful that this investment will make a difference in our region. I’ll be following it closely, but I think it is a positive step forward. In addition to the Defense bill, the Appropriations Committee also passed the Financial Services and General Government Appropriations bill. I was able to amend the bill this year to address a problem in our campaign finance system. There’s too much money in our politics. My amendment demands that the Federal Election Commission develop a plan for providing transparency with regard to who is buying the political ads they see in their online newsfeeds. While campaign finance laws require disclosure of information related to TV and radio ads, there are currently no disclosure requirements for online political ads. If you’ve been a subscriber to our newsletter for awhile, you know I introduced a bill that would shine a light on the murky world of political advertising by requiring the people and groups who buy online political ads to tell us who they are. That bill is called the Honest Ads Act. But while Congress has had a lot of dramatic hearings, and grilled tech executives like Facebook’s Mark Zuckerberg, it hasn’t allowed this bill to come up for a vote. I recently talked about why that’s a big problem in The Verge. This matters. Listen - I’m an advocate of significant campaign finance reform. I believe Congress should roll back the Citizens United court decision and give people their voices back. I’m for citizen-funded elections - not campaigns overwhelmed by deep pockets, special interests, and super PACs. Sadly, Congress has been entirely behind the curve on these issues. But at the very least, in the absence of more aggressive reform, I can’t imagine why Congress shouldn’t at least make sure voters know who is spending money trying to influence elections. Why not at least have transparency? If the leaders of Congress won’t allow a vote on my bill, I’m going to keep trying to find other ways to raise this issue. In March, I used a similar tactic to get a report out of the Federal Election Commission about its plan to ensure foreign money doesn’t end up in America politics. I’m looking forward to getting it back. There were some other good wins in these bills. For example, I was able to secure a request that the Federal Communications Committee show Congress its strategy for extending high-speed broadband to tribal communities. There are 11 federally-recognized tribes within the Sixth Congressional District. And, we rank in the bottom 20 percent in the nation for access to high-speed internet. That’s a big problem - and I’m going to have more news on this issue in a few weeks. Stay tuned! My main goal as a member of Congress is figuring out ways to create more economic opportunities for more people in more places. Half the jobs in our country are located at a small business, and so it’s a big deal that the spending bill included vital funding for something that’s really important to me - the Small Business Development Center program. The SBDC program helps entrepreneurs create new opportunities and grow their business. 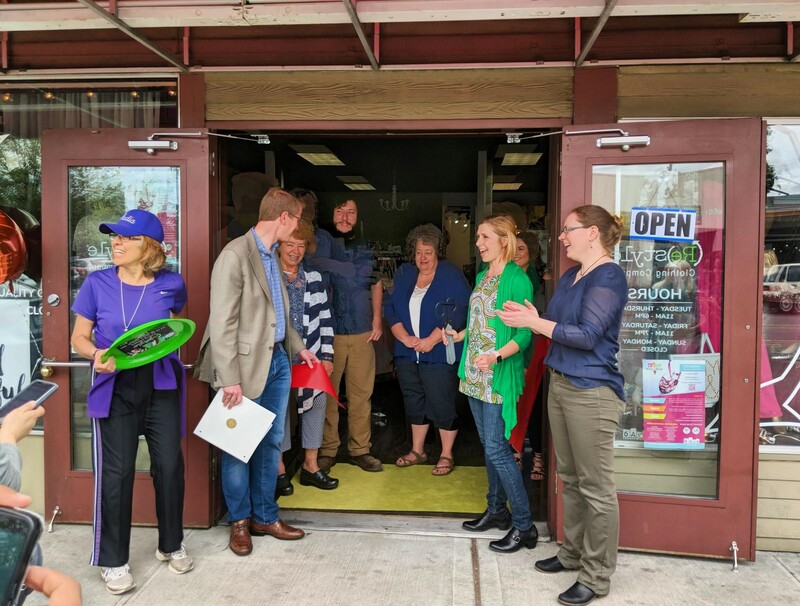 We’ve seen SBDCs working in Tacoma, Aberdeen, Port Angeles, and points in between – helping entrepreneurs and supporting job growth. With that in mind, this funding was really important. I’m glad my colleagues worked with me to get it in the spending bill this year. The next step for both Appropriations bills is a vote by the full House, which I expect will happen in the next month or so. The fact that all of these things passed out of the committee is good news. I’ll keep you posted on how things go from here. On a separate note, this week Congress passed nearly 30 bills related to helping address the opioid crisis. I cosponsored a bunch of them, and I spoke with the Daybreak Show about the details. We have an enormous opioid problem in this country. Every day across America, an average of 115 people die from an opioid-related overdose. And just 10 to 15 percent of the people who have an opioid addiction are receiving treatment. In response to this, all over the country, health care workers, law enforcement, social service providers, local governments, and others have been trying to address challenges associated with addiction. For too long now, Congress hasn’t given them backup. The bills the House passed will offer some help. The bills considered last week attack the opioid epidemic from different angles. The bills add NIH grants for more treatment centers, fund research for less addictive alternatives for pain treatment, and increase the ranks of addiction health care providers. Additionally, I cosponsored bills that passed last week focused on improving strategies related to synthetic drugs and preventing overdoses and related fatalities. These are complicated issues. One thing that’s clear is our community needs more mental health and substance abuse recovery beds so that people who seek treatment can get it. I’ve worked across the aisle with Rep. Jaime Hererra Beutler to introduce the Mental Health and Substance Abuse Treatment Accessibility Act so communities can scale up their treatment options quickly. I’m fighting hard to get that through Congress too. This also touches on the need for affordable health care that’s available to everyone - regardless of a pre-existing condition. Sadly, in the middle of this public health crisis, last week the Department of Justice backed a lawsuit that would dismantle the law that protects the right to affordable health care for everyone - including people with a pre-existing condition. Substance abuse disorder - addiction - is a pre-existing condition. At the same time, as a result of the harmful health care decisions made in Washington, DC last year, Washington state’s individual and family health insurance premiums are going to go up substantially. That increase (which will average 19% in the individual marketplace) may be the difference between people being able to afford health insurance or not. It’s the difference between people being able to afford treatment or not. 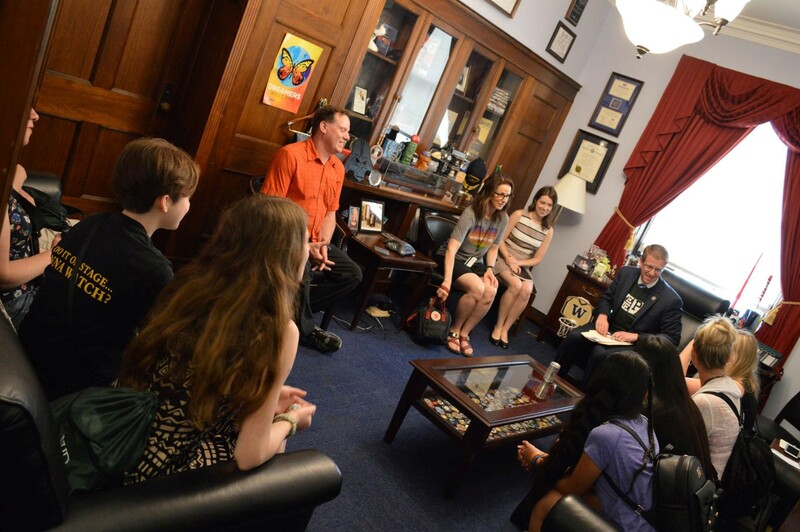 This week I met with some bright young women from Port Angeles who earned the chance to compete in the National History Day Contest. They won the spot with a thoughtful documentary on environmental issues in the region. And they brought me an awesome PA High t-shirt. Good luck! Go Roughriders! 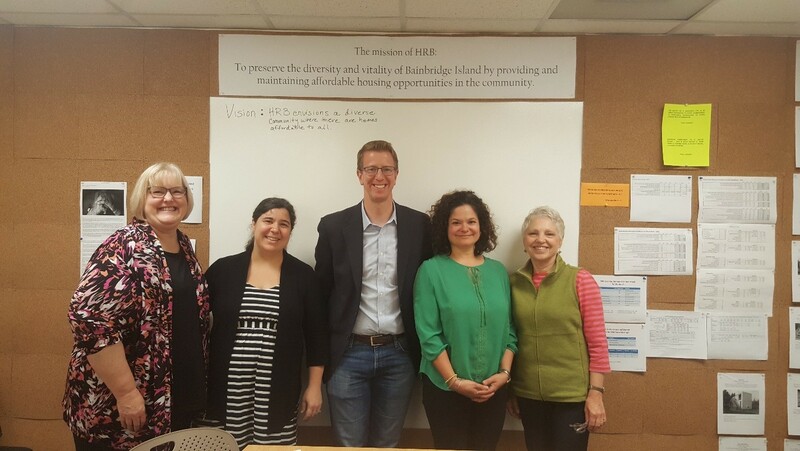 I recently met with Housing Resources Bainbridge to get an update on the region’s homelessness and housing situation. We recently released a report from the New Democrat Coalition regarding the lack of affordable housing. Check it out here. 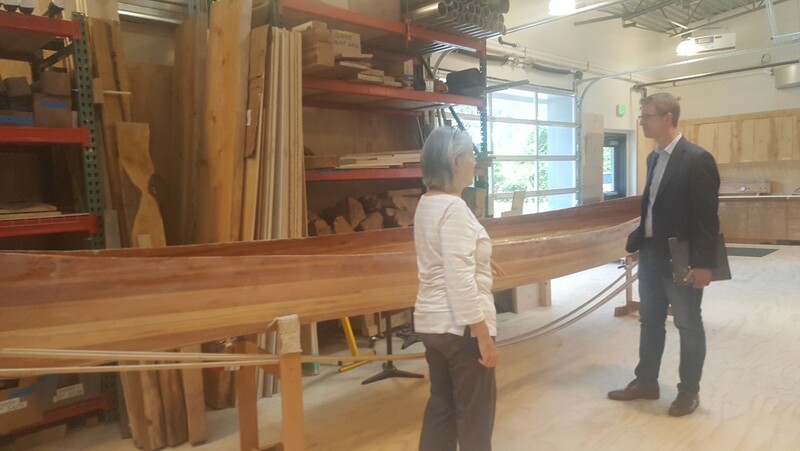 While on Bainbridge, I also visited the Bainbridge Artisan Resource Network (an outstanding maker-space) and Far Bank Enterprises – producers of some of the most amazing fishing gear in the world! It was really cool to see such outstanding ingenuity! That’s all for now. I hope everyone has a great two weeks! As always, I’m honored to represent you!